Input-Assembler Stage - Gets the input data (the vertex information) of the virtual world. Vertex-Shader Stage - Transforms the vertices to camera-space, lighting calculations, optimizations etc. Geometry-Shader Stage - For limited transformation of the vertex-geometry. Stream-Output Stage - Makes data-transport possible to the memory. Rasterizer Stage - The rasterizer is responsible for clipping primitives and preparing primitives for the pixel shader. Pixel-Shader Stage - Generates pixel data by interpolations. Output-Merger Stage - Combines various types of output data (pixel shader values, depth and stencil information) to generate the final pipeline result. Today's hi-tech graphic cards have only three programmable stages in order to reduce the complexity of the GPUs. The vertex processing stage (Vertex shader) and the pixel processing stage (Pixel shader) will be discussed here, for more details about geometry-shaders see . 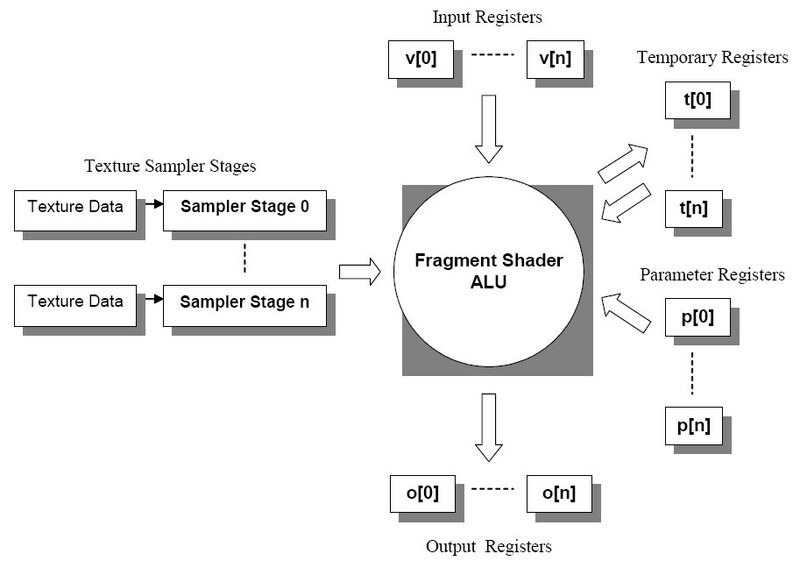 The two main application programming interfaces use different terms: pixel processing stage and Pixel shader in DirectX are called fragment processing stage and Fragment shader in OpenGL, respectively. 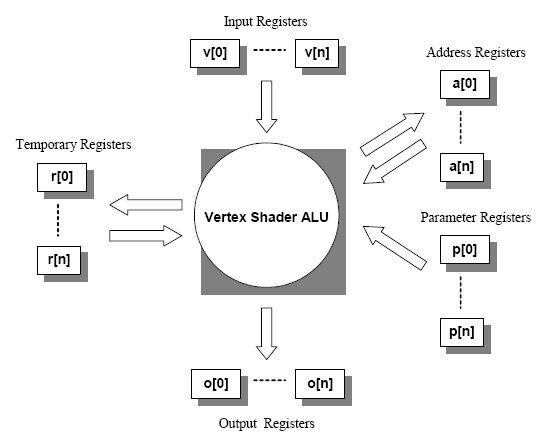 The Vertex shader engine gets the vertex data as input and, after several operations, writes the results in its output registers. The setup engine relays these data to the pixel shader engine after setting the hardware and interpolation. The pixel shader uses different kinds of registers and textures as input and from this information produces the color of the pixels (fragments) into the output register. These shaders will be discussed in the next chapters in details. I wrote some words about surfaces in the virtual world in the previous chapters. Because of mathematical reasons every surface is formed into triangles and operations are performed on the points of these triangles, which are called vertices. A vertex is a structure of data: position (coordinates), color and alpha values, normal vector coordinates, texture coordinates etc. but other required information can be stored among these values as well. I introduce here the key features of Vertex Shader version 1.1. Later versions are backward compatible, which means that everything defined here is correct and works well in newer versions as well. Each of these registers can store four floating point numbers, for instance every input registers from V to V[n] (this means that there are registers with number 0, 1, 2, …, n altogether: n+1 piece of them) can store four 32 bit-long floating point number. Input and parameter registers are read-only, output registers are write-only while address and temporary registers are both readable and writable by the ALU. Input registers store data about vertices. Parameter registers contain values which are valid for more calculations (shader constants), for example the world-view-projection matrix, light positions or light directions. Indexed relative addressing can be performed using the address registers. The shader works on one instruction but on more data parallel at a time, and generally can operate on whole matrices or quaternions. This data format is very useful because most of the transformation and lighting calculations require these kinds of data (vectors and matrices). The fact, that GPUs are designed to operate on more data in one clock cycle parallel enables them to calculate these special tasks much faster than the CPUs of the computers. The most important operations will be described in the next paragraph. Finally the results will be stored in the write-only output registers and passed on to the next stages of the fixed pipeline. These instructions are enough to make the most of the calculations but there were some which were complicated to perform, for example trigonometric functions needed to be approximated by different Taylor series. 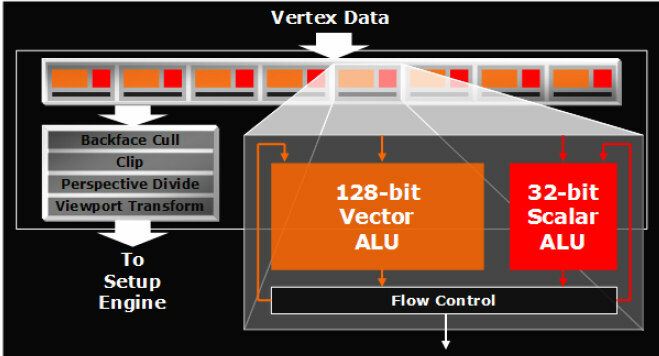 Later vertex shader versions made the job of the programmers more comfortable by supporting directly the computing sine and cosine, introducing flow control and new arithmetical instructions. For more details check the MSDN Library. The output of the vertex shader is a set of vertices, which is passed to the next stages of the graphical pipeline. After interpolation, face culling, viewport mapping, homogeneous division etc. the vertices will arrive to the pixel shader stage. For more details about vertex shaders, see ,  or . As you see, the main difference between pixel and vertex shader is the possibility to use texture operations in the pixel shader. Defining a texture as a render-target enables the opportunity to reuse any pre-rendered picture or texture for later calculations alsol. There are some other differences as well, for example, the order of the different kind of instructions is limited and there are several modifiers and masks to slightly change the input or output reading methods in the pixel shader. For more details see the MSDN library. High Level Shader Language or HLSL is a programming language for GPUs developed by Microsoft for use with the Microsoft Direct3D API, so it works only on Microsoft platforms and on Xbox. Its syntax, expressions and functions are similar to the ones in the programming language C, and with the introduction of Direct3D 10 API, the graphic pipeline is virtually 100% programmable using only HLSL; in fact, assembly is no longer needed to generate shader code with the latest DirectX versions. HLSL has several advantages compared to using assembly, programmers do not need to think about hardware details, it is much easier to reuse the code, readability has improved a lot as well, and the compiler optimizes the code. For more details about improvements, see . I have to mention that Cg shader language is equivalent with HLSL language. HLSL and CG are co-developed by Microsoft and nVidia. They have different names for branding purposes. As a part of DirectX API, HLSL compiles only into DirectX code, while Cg compiles into both DirectX and OpenGL code. HLSL code is used in the demo applications, so I briefly outline here the basics of the language. Here the types are float4x4. This means, 4 x 4 = 12 float numbers are stored in them together, and depending on the operation type, they all participate in the operations. This means, matrix operations can be implemented by them. The name of the structure is MY_STRUCT, and it has two fields (the names are Pos and Pshade and the types are float4 and float3). For each field, storing-registers are defined after the colon (:). I discussed the possible register types in the Shader chapter, although the possible register names vary on different Shader versions. The two types in the example are float4 and float3, which means, they are compounded of more float numbers (tree and four floats) which are handled together. The name of the function is main, and its returns MY_STRUCT variable. The only input parameter is a float4 variable called vPositions, and it is stored in the POSITION register. Two multiplications are also demonstrated in the example (mul operation), they are performed on different types: a matrix-vector multiplication is shown in the example. By changing only the variables, it is possible to multiply a vector with another vector, or two matrices with each other as well. A list of possible intrinsic functions can be found in Appendix B. Note that this is not a dot product between 4D vectors. Samplers are used to get values from textures. For each different texture-map, which you want to use, a sampler must be declared. The Direct3D library helps developers with an encapsulating technique called effects. Effects are usually stored in a separate text file with .fx or .fxl extension. They can encapsulate rendering states as well as shaders written in ASM or HLSL. The main ideas were shortly introduced about HLSL in the previous paragraphs. Shader programs of the demo applications are written using HLSL. For more detailed information, see the corresponding chapter or one of the mentioned references ( or ). A useful HLSL tutorial can be found here: . For a general comparison of shader version 2.0 and 3.0, see . PS_2_0 = DirectX 9.0 original Shader Model 2 specification. PS_2_a = NVIDIA GeForce FX-optimized model. "32 + 64" for Executed Instructions means "32 texture instructions and 64 arithmetic instructions." VS_2_0 = DirectX 9.0 original Shader Model 2 specification. VS_2_a = NVIDIA GeForce FX-optimized model. The source of the comparison tables is Wikipedia. The following table lists the intrinsic functions available in HLSL. Each function has a brief description, and a link to a reference page that has more detail about the input argument and return type. abs abs(x) Absolute value (per component). acos acos(x) Returns the arccosine of each component of x.
all all(x) Test if all components of x are nonzero. any any(x) Test if any component of x is nonzero. asdouble asdouble(x) Convert the input type to a double. asfloat asfloat(x) Convert the input type to a float. asin asin(x) Returns the arcsine of each component of x.
asint asint(x) Convert the input type to an integer. asuint asuint(x) Convert the input type to an unsigned integer. atan atan(x) Returns the arctangent of x.
atan2 atan2(y, x) Returns the arctangent of of two values (x,y). ceil ceil(x) Returns the smallest integer which is greater than or equal to x.
clamp clamp(x, min, max) Clamps x to the range [min, max]. clip clip(x) Discards the current pixel, if any component of x is less than zero. cos cos(x) Returns the cosine of x.
cosh cosh(x) Returns the hyperbolic cosine of x.
cross cross(x, y) Returns the cross product of two 3D vectors. D3DCOLORtoUBYTE4 D3DCOLORtoUBYTE4(x) Swizzles and scales components of the 4D vector x to compensate for the lack of UBYTE4 support in some hardware. ddx ddx(x) Returns the partial derivative of x with respect to the screen-space x-coordinate. ddy ddy(x) Returns the partial derivative of x with respect to the screen-space y-coordinate. degrees degrees(x) Converts x from radians to degrees. determinant determinant(m) Returns the determinant of the square matrix m.
distance distance(x, y) Returns the distance between two points. dot dot(x, y) Returns the dot product of two vectors. exp exp(x) Returns the base-e exponent. exp2 exp2(x) Base 2 exponent (per component). faceforward faceforward(n, i, ng) Returns -n * sign(•(i, ng)). floor floor(x) Returns the greatest integer which is less than or equal to x.
fmod fmod(x, y) Returns the floating point remainder of x/y. frac frac(x) Returns the fractional part of x.
frexp frexp(x, exp) Returns the mantissa and exponent of x.
GetRenderTargetSampleCount GetRenderTargetSampleCount() Returns the number of render-target samples. GetRenderTargetSamplePosition GetRenderTargetSamplePosition(x) Returns a sample position (x,y) for a given sample index. isfinite isfinite(x) Returns true if x is finite, false otherwise. isinf isinf(x) Returns true if x is +INF or -INF, false otherwise. isnan isnan(x) Returns true if x is NAN or QNAN, false otherwise. length length(v) Returns the length of the vector v.
lerp lerp(x, y, s) Returns x + s(y - x). log log(x) Returns the base-e logarithm of x.
log10 log10(x) Returns the base-10 logarithm of x.
log2 log2(x) Returns the base-2 logarithm of x.
max max(x, y) Selects the greater of x and y.
min min(x, y) Selects the lesser of x and y.
modf modf(x, out ip) Splits the value x into fractional and integer parts. mul mul(x, y) Performs matrix multiplication using x and y.
noise noise(x) Generates a random value using the Perlin-noise algorithm. normalize normalize(x) Returns a normalized vector. pow pow(x, y) Returns xy. radians radians(x) Converts x from degrees to radians. reflect reflect(i, n) Returns a reflection vector. refract refract(i, n, R) Returns the refraction vector. sign sign(x) Computes the sign of x.
sincos sincos(x, out s, out c) Returns the sine and cosine of x.
smoothstep smoothstep(min, max, x) Returns a smooth Hermite interpolation between 0 and 1.
tex1D tex1D(s, t) 1D texture lookup. tex1Dbias tex1Dbias(s, t) 1D texture lookup with bias. tex1Dgrad tex1Dgrad(s, t, ddx, ddy) 1D texture lookup with a gradient. tex1Dlod tex1Dlod(s, t) 1D texture lookup with LOD. tex1Dproj tex1Dproj(s, t) 1D texture lookup with projective divide. tex2D tex2D(s, t) 2D texture lookup. tex2Dbias tex2Dbias(s, t) 2D texture lookup with bias. tex2Dgrad tex2Dgrad(s, t, ddx, ddy) 2D texture lookup with a gradient. tex2Dlod tex2Dlod(s, t) 2D texture lookup with LOD. tex2Dproj tex2Dproj(s, t) 2D texture lookup with projective divide. tex3D tex3D(s, t) 3D texture lookup. tex3Dbias tex3Dbias(s, t) 3D texture lookup with bias. tex3Dgrad tex3Dgrad(s, t, ddx, ddy) 3D texture lookup with a gradient. tex3Dlod tex3Dlod(s, t) 3D texture lookup with LOD. tex3Dproj tex3Dproj(s, t) 3D texture lookup with projective divide. texCUBE texCUBE(s, t) Cube texture lookup. texCUBEbias texCUBEbias(s, t) Cube texture lookup with bias. texCUBEgrad texCUBEgrad(s, t, ddx, ddy) Cube texture lookup with a gradient. texCUBElod tex3Dlod(s, t) Cube texture lookup with LOD. texCUBEproj texCUBEproj(s, t) Cube texture lookup with projective divide. transpose transpose(m) Returns the transpose of the matrix m.